The annual 3 sister's weekend where pie making,knitting, coffee drinking and generally allot of home cooked food is made and eaten. A big change this year was the fact that Caitlin was not here to do the lion share of the cooking. That girl can cook and bake. Caitlin we did our best without you. Other than baking and cooking we visited the yarn store, Ellen and Mary had their hair cut, Mary a massage, Eileen went to an estate sale and bought some table clothes then off to the sustainable indoor market, long walks, good conversation over good wine and beer. The big thing we did not do this year was no eating out in restaurants. The Bean Cycle was visited twice for coffee and a pecan bars which as always was delich. Of course the first spring snow storm decided to rear itself, it was beautiful but made for a slow laid back weekend. What is it about cold and snow that one wants to only find a quilt and lay on the couch watching a movie: the movies we watched ....Italian Job, To Kill A Mockingbird, The Patriot, and 3-10 To Yuma. It has been awhile since I've blogged. Have been working full time, yes that is five days a week and yes it was a killer. However I am very grateful I have a job, a job a like and can do safely and well. This past week I finished a class on machine quilting and loved it, Charlotte opened a whole new world for me. Hope to have a quilt on the machine early next week. I still have a lot of nieces and nephews to get a quilt to before I get to old and can no loner sew. Plus yes I have allot of fabric to use up. What a job, but some one needs to do it. 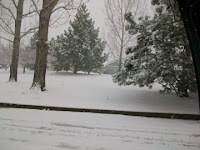 We have had a major spring snow storm yesterday. Not as much snow as past storms but it was a needed storm. I managed to get 4 rows of lettuce planted before the snow blew in, can't wait ti see the little plants popping up through the ground.